Starting our family vegetable growing patch has been an ambition, being in the throws of selling our house for over 12 months I was fed up waiting for my new garden in which I could start a vegetable patch. 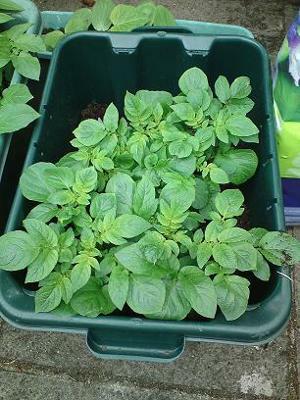 Already an existing Freecycler I noticed a post by someone giving away free seed potatoes. Little did I know this would be the start of something bigger. I started researching the best way to grow potatoes, on the web and asking friends. A friend suggested the best thing to use was an old recycling box, so there I was posting on Freecycle for people's old recycling boxes (our council recently having swapped over to wheelie bins). This seemed so practical, starting our family vegetable growing patch could begin and I would be recycling at the same time. It didn't stop there. My daughter (aged 3) was getting very excited about all the to-ing and fro-ing and wanted to join in. So we bought some lettuce, cauliflower, pumpkin and sweetcorn seeds as well as a couple of tomato plants. One Saturday afternoon there we were planting into pots on our patio all these little seeds. Then we did it we sold the house! We're now at the stage of moving into the new house next week (with an existing veg patch). My parents are now 'plant sitting' all my recycling, window boxes and my pots. Having instructed my dad to keep topping up the potatoes with compost, he now has his very own one with some Anya potatoes and sitting next to them are some tomatoes. There we are, thanks to a freecycler starting our family vegetable growing patch, it has now influenced three generations of our family who are now growing our own veg! Just a quick update! We're in the new house and this year we're trying sprouting brocolli, courgette, lettuce, tomatoes (from seed this year) and sunflowers! We've also started a little gardening club and one of our members has chickens, so we're all sorted for our manure needs! This year as part of fundraising for the local school we're having a plant stall so any excess seedlings can be put to good use. Great to hear you finally moved and started to get settled in. Looking forward to hearing more about your new vegetable growing adventures. I just wanted to let you know that your story is great. Your webpage has truly inspired me in a way which you probably didn't intend. I had never heard of freecycling. What a great idea! Through the vehicle of my community newspaper, I hope to encourage gardeners to participate in sharing seeds, offering excess produce from their gardens to those in need, and giving away usable planting containers instead of throwing them in their trash bins. Thanks to you, I'm on a crusade to turn our "disposable" society into a "sharing" society. I'll start by offering that stack of big plastic plant pots taking up space in my garden shed. By the way, you can find my own webpage on this same website. What a great story of unintended consequences. I wish you well in your new home and look forward to reading your updated comments on your web page of how you and your daughter are developing your new vegetable garden. And I hope your dad's fingers take on a permanent shade of green. Thank you for telling us about your inspiring experiences. Join in and write your own page! It's easy to do. How? Simply click here to return to Have A Vegetable Garden? - Your Story.